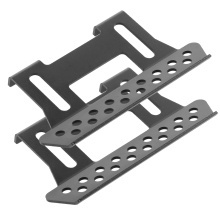 This metal side pedal plate is for 1/10 RC crawler, Axial, SCX10. Be made of high quality materials for long lasting performance. Good choice for you. It is suits for 1/10 AXIAL, SCX10, RC4WD. Very good decorations, making car looks more vivid.